Ensuring universal access to sustainable forms of energy is a key development goal and is essential to improving the lives and wellbeing of women, men and children around the world. To counteract energy poverty and enhance development, the Secretary General of the United Nations launched Sustainable Energy for All (SEforALL) in 2012. To understand the extent to which gender is being mainstreamed in SEforALL related activities, the International Union for Conservation of Nature’s (IUCN) Global Gender Office (GGO) conducted an assessment of 61 SEforALL country action plan documents, from 52 countries. 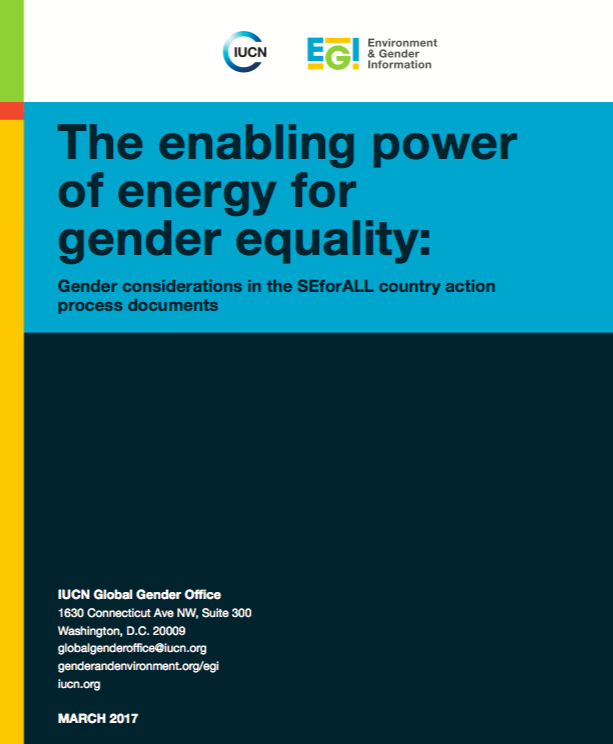 It is expected that the findings of this report will support the work of SEforALL’s Global Team and inform future work of the Gender and Energy Accelerator, to further the gender equality objectives of the strategic framework for results.